Yup, this is myself and the ex, in 1995. I was in my early thirties, and somehow I became involved in local mainstream politics. The red tie not so subtly betrays my party affiliation. I don't really talk much about those days, or how I ended up as a mayor of a small English town for a term. How and why does someone become political? What is it in their nature or upbringing that drives them into that direction? There was no hint of it at school age. I wasn't really the most politically aware kid on the block. Neither did I grow up in poverty, desperate to climb out and to make my mark. If I think deep, there was a sort of a sympathy with the underdog, and perhaps I was taught a sense of fair play. If I'm to be honest with you, I pretty much discovered socialism and Marxism very suddenly and energetically in my early twenties, and became a born again revolutionary. I spent a year or two playing at revolutionary politics, then did what society programmed me to: work more hours, pay tax, get married, raise children get a mortgage, die. I skipped out on the dying bit when I hit a damaging mid-life crisis. For the time being any way. But somewhere in that process, I still craved a bit of political action. I lived in a little town in Norfolk, there was no revolutionary presence. So I instead joined the local branch of the Labour Party. This was still in the days of Clause 4. Full of zest, I took part in stupid games between cliques, knocked on doors, attended meeting after meeting, every working party of every sub committee. I took office within the branch and constituency, levered support from my trade union. Part of that progression involved standing for public office. I indeed stood for a seat on the local town council. Against all expectations, I lost to a Tory candidate. The next day at the branch post mortem, someone looked at the mathematics, and it didn't add up. There was a miscount. An excuse for a political campaign, the branch took it to the High Court, then to the Old Bailey. Ballet boxes were opened, and a gross but basic mistake spotted on the top, on a totting up note. I was declared rightful councillor, and the poor Tory candidate booted out. 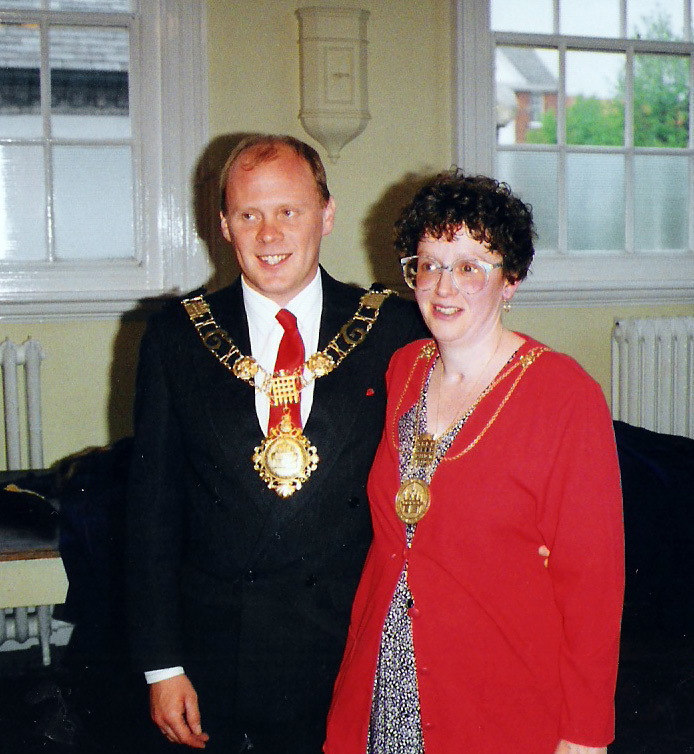 The above photograph was taken early into my second term as a councillor. I had also won a seat on the District Council. I was made the mayor of Thetford. Maybe more on that experience, and my subsequent views on the state of local democracy in England in a later post.